The idea of dancing can be intimidating to many people, but it becomes much less scary when done surrounded by your friends and on your own campus. Add to this a “geeky” dress code and you have the perfect recipe for a fun-filled night of dancing with the members of URI Ballroom Dance at their Geek Gala. 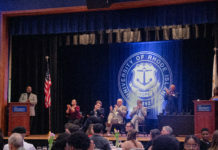 Tomorrow at 7 p.m., URI Ballroom Dance will be hosting an event known as the Geek Gala in the Memorial Union Ballroom. Entry is $5 for all students, whether you attend the University of Rhode Island or another school, and $10 for community members. The club hosts two dances per semester, each with a different theme for participants to dress up for. Most recently, the New Orleans-themed “Mysteries of the Bayou” dance occurred this past October. The Geek Gala will not be your typical school dance. Instead of bobbing in place or participating in grind lines, attendees of the Gala will have a chance to perform different styles of dance with real steps. There will be members of the club present to help and instruct anyone who wants to learn or improve, and one of the instructors will be performing at the event with his wife. Vigneau has been a member of URI Ballroom Dance for almost three years. However, his rise to the presidency was not without thanks to practice and dedication. The proceeds from the upcoming Geek Gala, and all of the events held by the club, are used to keep the organization up and running so that they may continue to have classes and hold events for all students. These events are open to all students to come see what the club is about, and participate in the fun. Students are welcome to try out the different styles of dance for just one night or to decide to join based on their individual experiences.